"Mermaids: The Body Found," a recently aired documentary-styled science fiction program on the Discovery Channel's Animal Planet, has stirred some public interest in whether mermaids are real or not. So much interest, in fact, that the U.S. National Oceanic and Atmospheric Administration wrote a piece on its Ocean Facts page denying their existence. July 5, 2012--Ben Sherman, a spokesman for the Ocean Service, said the item on mermaids was posted June 27 in response to queries about Discovery's fictional "documentary." There was also interest on a couple of NOAA's Facebook pages, he said in an email to Reuters on Thursday. "This Ocean Fact received little attention until the Discovery News Channel reposted it with commentary on June 29," Sherman wrote. The Discovery site - here - suggested NOAA responded because Discovery's documentary-style show, "Mermaids: The Body Found," had painted a convincing picture of the existence of mermaids. "The show was an 'X-Files' type fanciful mix of state-of-the-art computer generated animation, historical fact, conspiracy theory and real and faked footage sprinkled with enough bits of scientific speculation and real science to make it seem plausible," the Discovery site said. A mermaid is an aquatic creature, typically depicted with the head and torso of a girl or woman, and the tail of a fish. 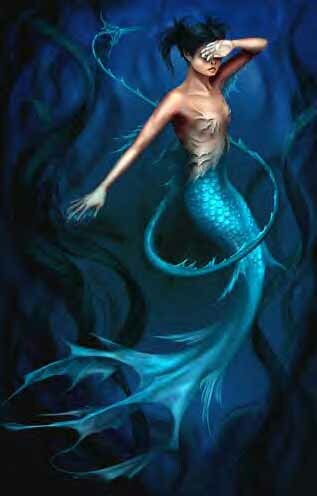 Mermaids appear in the folklore, literature and popular culture of many countries worldwide. The masculine equivalent is called a “merman,” and the general terms "merfolk" or "merpeople" are occasionally used to refer to groups without reference to gender. 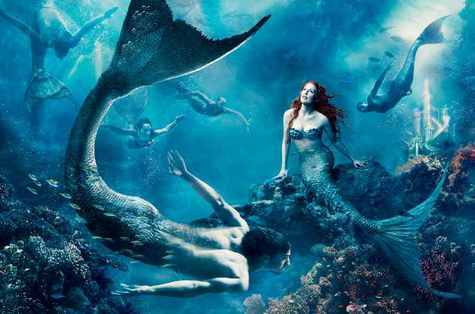 "Mermaid" is a compound of mere, the Old English word for "sea", and maid, a girl or young woman. The equivalent term in Old English was merewif. When were they first reported? The first known mermaid stories appeared in Assyria, ca. 1000 BC. The goddess Atargatis, mother of Assyrian queen Semiramis, loved a mortal shepherd and unintentionally killed him. Ashamed, she jumped into a lake to take the form of a fish, but the waters would not conceal her divine beauty. Thereafter, she took the form of a mermaid-human above the waist, fish below—though the earliest representations of Atargatis showed her as a fish with a human head and arm, similar to the Babylonian Ea. The Greeks recognized Atargatis under the name Derketo. Prior to 546 BC, the Milesian philosopher Anaximander proposed that mankind had sprung from an aquatic species of animal. He thought that humans, with their extended infancy, could not have survived otherwise. Portland Maine--Shiloh Pepin, a girl who was born with fused legs, a rare condition often called "mermaid syndrome," and gained a wide following on the Internet and national television, has died. She was 10. Doctors had predicted she would only survive only for days after her birth at the most, but the girl, described by her mother as "a tough little thing," died at Maine Medical Center on Friday afternoon, hospital spokesman John Lamb said. She had been hospitalized in critical condition for nearly a week. Being born with "mermaid syndrome," also known as sirenomelia, meant that the Kennebunkport girl had only one partially working kidney, no lower colon or genital organs and legs fused from the waist down. Some children who have survived sirenomelia have had surgery to separate their legs, but Shiloh did not because blood vessels crossing from side to side in her circulatory system would have been severed. She had received two kidney transplants, the last one in 2007.